As a result of a series of attacks and counter-attacks on Republican presidential candidate Mitt Romney’s work with Bain, there’s been a lot of discussion about private equity, buyouts of firms, and their ultimate relation to the economy. So far the discussion has been a back-and-forth on layoffs and “creative destruction,” with very little on how laws and regulations structure the way private equity and buyouts happen in this country. 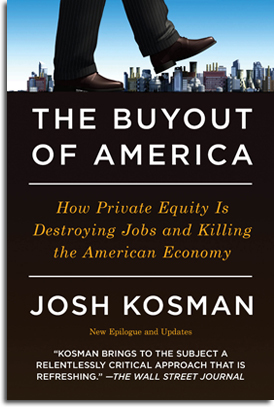 I interviewed Josh Kosman, author of The Buyout of America: How Private Equity Is Destroying Jobs and Killing the American Economy, on this topic. Bob Kuttner reviewed his book in May 2010, and Kosman was on Up with Chris Hayes last weekend discussing this topic. The interview has been edited for length. Mike Konczal: What are private equity funds, and what do they do? Josh Kosman: Private equity firms are mostly former Wall Street bankers who raise money to buy companies on credit. They used to be called leveraged buyout (LBO) firms, and when the first leveraged buyout boom went bust in the 1980s they regrouped and called themselves private equity. The big difference between them and venture capitalist or hedge funds is that the companies that they buy borrow money to finance the acquisitions. Private equity firms own more than 3,000 U.S. companies and employ roughly one out of every 10 Americans in the private workforce. This is just America, so it doesn’t include companies or employees overseas. Some companies include HCA, the largest hospital chain, to Clear Channel, the largest radio station operator, to Dunkin’ Donuts. They are in every industry. People coming to the defense of private equity from both the left-neoliberal and conservative spaces directly invoke or allude to “the market” as a natural, already existing thing. But a key progressive retort to this laissez-faire view of economics argues that all markets are deeply embedded in and constructed through legal, tax, and other regulatory government codes. Your research has found that, far from being natural, private equity exists largely due to issues with the tax code. Can you explain? Yes. It’s a transfer of wealth as well. It’s taking the wealth of the company and transferring it to the private equity firm, as long as it can pay down its debt. It think it is real – the very early firms targeted industries in predictable industries with reliable cash flows in which they by and large could handle this debt. As more went into this industry, it became very hard to speak to the original model. Now firms are taken over in very volatile industries. And they are taking on debts where they have to pay 15 times their cash flow over seven years — they are way over-levered. The most common argument for why Bain Capital and other private equity firms benefit the economy is that they are pursuing profits. They aren’t in the business of directly “creating jobs” or “benefitting society,” but those effects occur indirectly through the firms making as much money as they can. But even here, “profits” — how they exist, where they come from, and how they are timed — have a crucial legal and regulatory function. A recent paper from the University of Chicago looking at private equity found that “a reasonable estimate of the value of lower taxes due to increased leverage for the 1980s might be 10 to 20 percent of ﬁrm value,” which is value that comes from taxpayers to private equity as a result of the tax code. Can you talk more about this? If you look at the dividends stuff that private equity firms do, and Bain is one of the worst offenders, if you increase the short-term earnings of a company you then use those new earnings to borrow more money. That money goes right back to the private equity firm in dividends, making it quite a quick profit. More importantly, most companies can’t handle that debt load twice. Just as they are in a position to reduce debt, they are getting hit with maximum leverage again. It’s very hard for companies to take that hit twice. If you look at Ted Forstmann, an original private equity person who just passed away, he would rail against dividends in this manner — borrowing money to pay out dividends. He was more interested in taking companies public and selling shares and paying down debts and collecting proceeds that way. I can respect that a lot more. The initial private equity model was that you would make money by reselling your company or taking it public, not by levering it a second time. Private equity and buyouts started as a way to take advantage of tax gimmicks, not as a way of saying “we’re going to turn around companies.” And now it’s out of control. I look at the 10 largest deals done in the 1990s, during ideal economic times, and in six cases it was clear that the company was worse off than if they never been acquired. Moody’s just put out a report in December that looked at the 40 largest buyouts of this era and showed that their revenue was growing at 4 percent since their buyout, while comparable companies were growing at 14 percent. In January — so just in the past 12 days — Hostess, the largest bakery in the country, just went bankrupt. Coach, the largest bus company, just went bankrupt. And Quizno’s is about to go bankrupt. All of these were owned by private equity. This battle is part of a larger discussion of, in Henry Manne’s phrase, “the market for corporate control.” The tax code is set to overlever firms, which require increases in earnings to go toward debt payments instead of research and development, expansion, and other things that build the firm. What could we change to generate different outcomes? That’s exactly right. Right after this goes on for a few years, you’ve starved your firm of human and operating capital. Five years later, when the private equity leaves, the company will collapse — you can’t starve a company for that long. This is what the history of private equity shows. What I’d like to see Mitt Romney do is to show an example of a buyout that went well. The only success stories he’s talking about on any level are venture capital investments — Staples and Sports Authority. Personally I like venture capital, I think it provides a lot of value, but that’s not what he did mostly, and that’s not what these takeovers are about. I wrote about this for The Fiscal Times and posted it here: http://gooznews.com/?p=3516. If companies are taking out more debt than they can handle, who is buying it? What is the default rate? Is it rated properly? The companies are also bled dry with exec pay, management fees, key asset sales, brand canibalization, and sweatheart deals with insider vendors. She also covered (and clarified) some of the major research that’s out there on private equity. I’d say eradicate all interest deductions — business, mortgage, the lot… Encourage equity, not debt. Of course, there is another option: the critics of private equity could put their money where their mouth is and buy the company in question. Then they could run it any way they like. Private equity firms have to have an exit, which is typically to sell the company, either to the public or to another investor or investors. How does “destroying” the company, as those here suggest, enhance their ability to sell the company? Whatever you may think, the objective of private equity is to maximize shareholder value. That used to be considered a good thing. I do agree with Mr. Roth. Just simplify the tax code and eliminate the distortions that deductions like this create.